Thanks for this light-hearted (not high-headed) article! 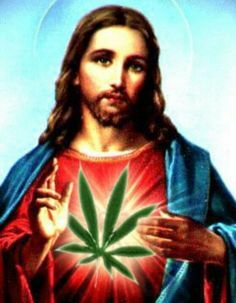 You know… you may have actually started me thinking about the possibilities of a Jesus-cannabis connection. Not for getting “high”, but a fair chance, at least, that he might have used it or had it used on him in oil or ground-leaf or flower form. I was just hearing (probably on 4-20!) that cannabis is one of the most widely spread medicinal plants in the Americas, including the US… I believe was the contention, tho fuzzy on the details… no, not for THAT reason. I won’t even take time for a Wikipedia check, but I believe it is common world-wide also. And goes back a loooong time. Certainly the Bible cites many instances of the use of herbs, oils and balms (lotions?). Some may recall an Evangelical classic of many years ago, by an MD, “None of these Diseases”. Sort of an early plea for more “natural medicine” along with a claim that God had revealed the plants and uses to the Jews, if that distant memory serves me. So, as to Cannabis, its healing qualities are now well established, beyond the psychotropic effects. It wouldn’t be anything shocking to me, and it shouldn’t be to more orthodox believers I don’t think either, if indeed it COULD be shown that someone in the Bible had used some form of Cannabis. Somewhat related: regular, perhaps sometimes mood-altering use of wine (not mere grape juice) seems to be just assumed in the Gospels, and the author of Ephesians (perhaps Paul) warns against taking it to drunkenness (a common-sense warning as much as a spiritual one). Then the author of the Pastorals advises Timothy to use wine medicinally. So we’re not far from potential use of cannabis though I see no point in anyone trying to “make a point” out of it…. That is, beyond the observation that believers have, probably since the beginning, taken different positions on just how and when foods and drink (and herbs, correspondingly) should be used, sometimes argued (a bit foolishly in my view) from the Bible. I think the use of cannabis (and a whole range of herbs). is quite pervasive across many cultures, although not really the same use most of the college aged 4/20 people advocate. As you know, Howard, one of the the points made by the Gospels about Jesus’s miracles (whether you accepted them as historical fact or not) is to separate how Jesus heals from other ancient heals (either through the prayers of righteous men or through the cult of Asclepius. The same is true for exorcisms, etc. The assertion in the articles I made light of in the post is that Jesus used homeopathic medicines to heal, which is a flashback to the pre-Schweitzer Lives of Jesus Movement. Schweitzer points out several nineteenth century German liberal Lives of Jesus that accept Jesus’s healing story, but explain that he always had his eye-ointment from Egypt with him. Several things stand out here: I am hardly a kid (based on your profile pics, we are probably about the same age, I might be older), I certain have a grip on this issue. More important, you miss the point of the critique of the plagiarized article on the New Age site. I am not opposed to the use of cannabis to treat all sorts of diseases, nor do my comments attack the sub-culture you represent (do what thou wilt, etc). I even linked to your youtube video (and let your link stand in the comments). You seem a little uptight for a cannabis advocate. And the original post was tagged as humor. Connecting Jesus to 4/20 is really quite funny. Or at least I thought so. tl;dr – The cited article have no clue what they are talking about. Source: PhD in Biblical Studies. You are right it was actual magical miracles from god just like the Bible says. 😉 Never mind that In her essays Tracing One Word Through Different Languages (1936) and Early Diffusions and Folk Uses of Hemp (1975), Sula Benet demonstrated that the Hebrew terms ‘kaneh’ and ‘kaneh bosm’ (also translated ‘qaneh’, and ‘qaneh bosm’) identified cannabis, by tracing the modern term back through history, noting the similarities with the later Mishna term for cannabis, kanabos, as well as comparing it to the ancient Assyrian word kunubu (also translated qunubu) which has long been regarded as identifying cannabis, and which was used in an almost identical ritual context as kaneh bosm was by the ancient Jews. The root “kaneh” in this construction means “cane~reed” or “hemp”, while “bosm” means “aromatic”. This word appeared in Exodus 30:23, whereas in the Song of Songs 4:14, Isaiah 43:24, Jeremiah 6:20, Ezekiel 27:19 the term keneh (or q’aneh) is used without the adjunct bosem. As Sula genet has explained, the Hebrew word kaneh-bosm was later mistranslated as calamus, a common marsh plant with little monetary value that does not have the qualities or value ascribed to kaneh-bosm. This error occurred in the oldest of the Greek translation of the Hebrew texts, the Septuagint in the third century BC, and then repeated in following translations. Noted cannabinoid research Dr. Ethan Russo, who has done extensive research into the history of cannabis has expressed:“I think it is absolutely clear that cannabis was in the Holy Land, we have archeological proof dated to the 4th century [AD] there was this carbonized fragment of cannabis that was found in a cave at Bet Shemesh in Israel. Additionally, I firmly believe that kaneh bosm in the Hebrew was cannabis, so I am absolutely convinced it was there. …its mentioned in Exodus that kaneh bosm was part of the Holy Anointing Oil, also used as an incense and it really makes sense.” (Russo, 2003) As Ruck and co-authors have noted the term “occurs also in Song of Songs 4.14, where it grows in an orchard of exotic fruits, herbs, and spices… It occurs also in Isaiah 43,24 where Yahweh lists amongst the slights received in sacrifice, the insufficient offerings of kaneh bosm; and Jeremiah 6,20, where Yahweh, displeased with his people, rejects such an offering; and Ezekiel 27.19, where it occurs in a catalogue of the luxurious items in the import trade of Tyre…. This conclusion has since been affirmed by other scholars. It is ironic that calamus “sweet flag,” the substitute for the alleged cannabis, is itself a known hallucinogen for which TMA-2 is derived” (Ruck et. al., 2001). Benet suggested that this indicated an ancient semitic origin for the term ‘cannabis’, however the Biblical references, indicate that cannabis came to the Hebrews as an item of trade, and with it, its Indo European name, kanna, which was adopted into the hebrew lexicon. This is the view of both myself, and Prof Carl Ruck (2014) And it is supported by the textual references to kaneh which identify it as an item of trade “Danites and Greeks from Uzal brought you merchandise; they exchanged wrought iron, cassia, and kaneh for your wares.” (Ezekiel 27:19)), as well as in Jeremiah 6:20 which refers to “kaneh from a distant land.” Benet pointed to contact between the Hebrews and Scythians (Benet, and archeological finds of Scythian artifacts from the Holy Land have been reported (Benet, 1975). References to cannabis in the cognately similar Assyrian term Qunubu help take the case beyond similar sounding words, and cultural trade connections, identifying an identical use of cannabis incenses and ointments for spiritual purposes, to that of the Holy oil and Incenses of the Old Testament Jews. In ancient Mesopotamia cannabis was used both medicinally and oils and incenses were prepared from the plant because its “aroma was pleasing to the Gods” (Meissner 1925). In the second quarter of the first millennium b.c., the “word qunnabu (qunapy, qunubu, qunbu) begins to turn up as for a source of oil, fiber and medicine”(Barber 1991). In our own time, numerous scholars have come to acknowledge qunubu as an early reference to cannabis. You do not have to believe an actually miracle happened to appreciate my point. You are actually more conservative and fundementalist than most scholars at Society of Biblical Literature, for example, because you insist Jesus actually healed people. My point is you are on the fringe of both science and biblical studies. That’s cool, sometimes the fringe is a good place to be. But at least be honest that. Everyone you cite in your response is out there too. I do not have a problem with you as a representative of alternative medicine or alternative biblical studies. Just do not think there is some dark conspiracy out there suppressing these ideas. Hey P. Long! Just curious: what do you think of people claiming that “unauthorized fire” in Leviticus 11 is some sort of hallucinogen? Particularly in cultic practices, it seems like the euphoria from drugs could’ve been misunderstood as “interacting with the divine” or something… it could also fit with the prohibition of alcohol for priests later in the same chapter? Just wondering. I’m not high. I’m not sure if you expected me to not comment on a post where you mention cannabis (if I were to say it professionally) AND Jesus, but here I am. It’s always weird to think about things that we find dubbed by society as taboo and what biblical context we drag up to make it so, when sometimes things aren’t so disagreeable. I, too, believe in the use of marijuana for medicinal purposes (I have a cousin that does so), and although I don’t think it’s a necessity a friend and I occasionally have the discussion “Hey, if God put it here, it can’t be all bad, right?” While I understand that because of sin the world was poisoned with disease, I don’t think cannabis falls under that category, in fact I would argue to opposite. So we’re left with this strange moral conundrum; if it’s here, there’s a reason for it, isn’t there? Or maybe there isn’t? Even mosquitoes have their purpose in the ecological function of the world, besides draining humans of blood and making us itch. So maybe cannabis has its purpose too. But what do I know, I’m just a kid. Hey, I found this article really good. Keep the work going on!